This post was originally published a couple of weeks ago, but we are enjoying this activity so much that I decided it was a perfect post to bump up and share on WFMW! The kids and I have recently become "pillow pen pals". I got the general idea from a post on Pinterest, where a mom posted the journal that she and her daughter share... and said she got the idea from another blogger, who got it from another blogger, and so on. Obviously this is a fun idea that's making the rounds in blog-land! I loved the idea, so I put my own spin on it: simply using two notebooks from my school supply stash and hiding them under the kids' pillows for them to discover the first night. It turns out that my kids have loved it! I refuse to correct grammar or spelling in these notes, because I don't want this to feel like a school assignment. It's become a lot of fun for all of us, and reading their sweet notes to me has quickly become my favorite part of the day. 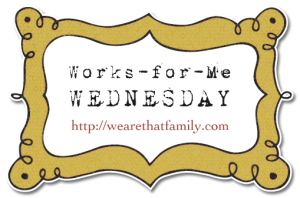 Share your own 'Works for Me Wednesday" tip HERE. Very cute! That is a great way just to get a window into their little hearts and minds! Thanks for this!